Many families end up spending more than they would like to on the weekly household shop, here are some tips to help you save on grocery shopping. There are many reasons for over spending when shopping for groceries, not least because of the delicious foods on display and tempting offers calling out to buy now. To help, we have gathered some tips to save on grocery shopping and keep the bills low. By grocery shopping online you can save yourself the cost of driving and parking, remove the physical effort of shopping (especially when pregnant or with small children), and you can ensure you are not hungry and therefore be less likely to add lots of those tempting things to the basket that you really don’t need! Whichever supermarket you prefer to shop, make sure you go online and click through via KidStart first. 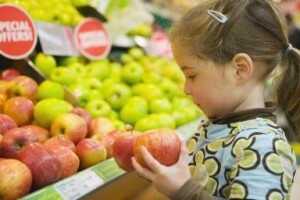 That way you can be sure to top up your kids savings while you shop: check out our groceries section. 2 – Take advantage of your freezer and invest in one if you don’t have one. 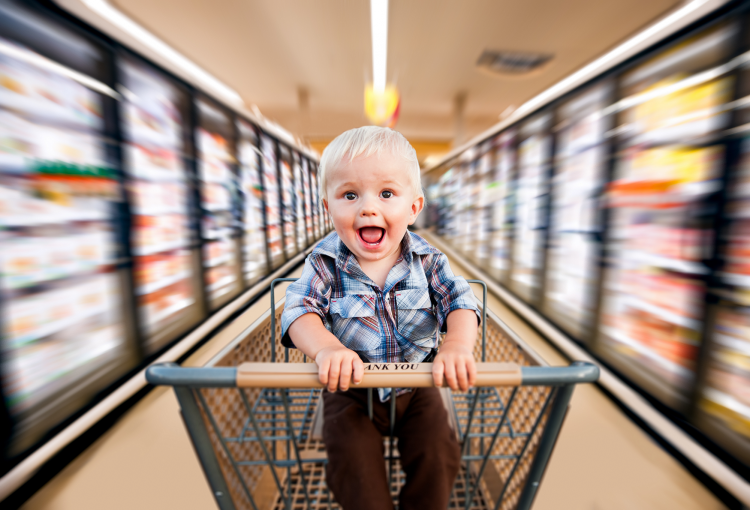 Whether you are starting a family or have just settled down, one of the best investments you’ll make is a full size freezer – buy using KidStart and get money back for your kids at John Lewis, Amazon, AO.com, or Electrical Discount UK. Frozen vegetables and fruits: Including sweet corn, peas, broccoli, cauliflower, berries… you name it! These come in handy for all kinds of dishes and they keep in the freezer for months – meaning that you will have a steady supply at a great price. Meats, fish, poultry: This is another great way of cutting food shopping costs and having weekly meals sorted – you only have to defrost whatever you want to use in advance. If I’m planning on making salmon for dinner, I will take it out of the freezer and pop it into the fridge in the morning. Bread: At home we never go through an entire loaf of bread before it goes bad, so I keep it in the freezer and I use it up as needed. My personal favourite: Vogel Bread. It has not additives and it’s completely natural. Now this you have to keep an eye open. I like to do some maths every time I do my shopping so I truly know when I’m paying the lowest price. I always look at the prices per 100g or per kg – this gives me an accurate reading on which items are cheaper and where, since you will find this information in every supermarket’s site. Most spices usually come in glass jars which can be expensive – usually going for £1.50 and over. Next time you finish up your Cumin Seeds or Paprika, have a look around the World Food sections and see if you can purchase a bag of a certain spice in bulk. 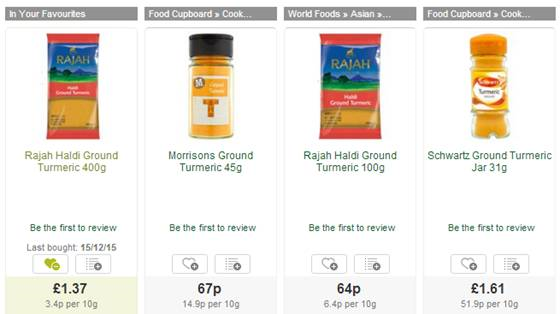 I buy my Cumin and Turmeric in 400g bags. Here’s a side by side of the same item but packaged differently – look at the price per 10g! All major supermarket chains now offer a home delivery service, this enables you to order certain things from each one ensuring that you can save on your grocery shopping. After browsing for some time, you might realise that Sainsbury’s has the best selection of World Foods for your curries and Thai dishes while Waitrose offers great quality meats at affordable prices when bought on offer. This will ensure you get the best possible deals each time. Every 500 points at you rack up on your Nectar card when Shopping at Sainsbury’s equals £2.50. They usually launch offers where you can earn extra points online and in-store. Just remember to use KidStart when shopping online to also get up to £2 back for your kids when shopping at Sainsbury’s. If you prefer Tesco and have a Tesco Clubcard, you will get points every time you shop that can be redeemed for vouchers. They can be used not only on Tesco products but also on meals out and cinema tickets. Plus get up to 1% on your Tesco shopping with KidStart. Ocado takes back any plastic bags you give the driver and gives you back 5p for every bag. And if you’d rather not be charged for your bags, some supermarkets give you the option to have your shopping delivery without bags – so they come in crates and you can unload them straight in your kitchen, then give them back to your driver. Easy! Download the KidStart Savings Prompt to make sure you don’t forget to use KidStart when buying your weekly groceries and you will be sure to top up your kids savings every week. 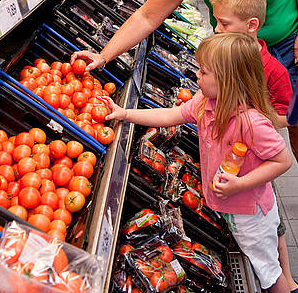 What are your tips to save on grocery shopping?